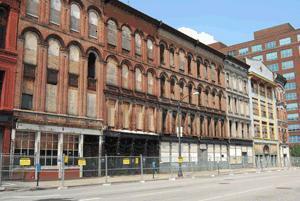 The cost will be “significant,” but most of the deteriorating buildings in the 100 block of Louisville’s West Main Street – known as “Whiskey Row” during the city’s heyday as the capital of the bourbon-shipping world – can be saved, investors said in a story in yesterday’s Courier-Journal. The investors, led by Brown-Forman heiress Laura Lee Brown and her husband, Steve Wilson, hope to have the first tenant in by the end of 2013. They haven’t specified how the five buildings will be used, but they hope to have at least one bourbon-related concern involved.